Bruno Sbille, a trainer and coach who lives in Belgium, did a session at the XP Days Benelux 2012 conference, on the topic: learn different leadership styles with Star Wars coaches. InfoQ interviewed him on using leadership styles, visual management, and agile coaching. 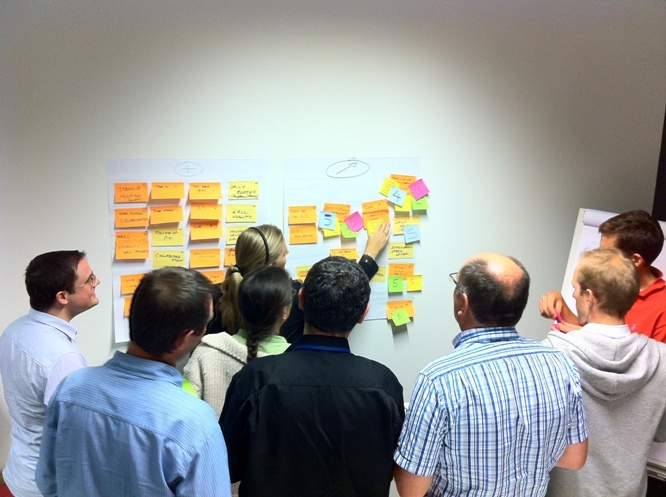 InfoQ: Your session at XP Days Benelux 2012 was about leadership styles. Which styles did you discuss in that session? InfoQ: Why did you pick these leadership styles? Blame culture means: In case of a major issue, someone is to blame and should be identified and reprimanded. I wanted to emphasize that this leadership style should be avoided, but we all tend to use it. While debriefing in the session at XP Days Benelux, some participants said we sometimes tend to blame in the Agile community, for instance, the Manager is to be blamed, or the Waterfall methodology. Directive Management means: “I tell you What to do and How. Please proceed as if you were me” This management style is the most common but often less efficient. Nevertheless, in some situation, it is well appropriate. Personal consideration means: Doing something especially and uniquely for the person. Consider the person as sole and unique. I like this leadership style. It comes from the NLP (Neuro-linguistic programming) theory and is less known in the Agile community. Management by Objectives means: "I give you an objective and we discuss the why and the benefits if we achieve it. The objectives need to be defined and agreed by both parties. The Manager is more interested in final results than in the method. I like this management style as it increases creativity and initiatives taking. It is used in defining User Stories. InfoQ: It seems that you use some terms such as leadership and management by objectives different as others use it? Bruno: I agree with you. First of all, summarizing these terms in just a few lines can seem a shortcut. In my session, I start by explaining all terms, so that the audience and I can agree on a common wording, which we can practice quickly. some use the term : 'Situational leadership' others use the term "delegation"
InfoQ: How important is it to use a suitable leadership style, for instance when doing agile coaching? Bruno: In my session at the XP Days Benelux conference, all participants experimented with the use of different leadership styles in a role play. Some played the ‘manager’ when others were ‘managed’, or were just ‘observer’. While debriefing, participants shared their preference, and discussed which leadership style was more adequate for them: Which style would they rather use as a manager, or receive by their management? So it appears that each person has their own leadership and management preference style. It is however important to consider the working environment and rationale to determine which leadership style is more appropriate to use. The directive management, though less appreciated, can be more efficient when managing a junior team at a Scrum starting phase or when managing an emergency situation. In conclusion, the different leadership and management styles are powerful ways to communicate and can be used by all involved (not only top management, but also within team members), and we need to learn how to use one or another according to the person and to a situation. InfoQ: How can people learn different leadership styles, and get better in using them? In each column, name people (maximum 5) you know professionally or personally that are best or worst communicator. You can try these different leadership styles as defined in the slide set and exercise them to discover your and the person’s preferences. InfoQ: On your blog, you also wrote about visual management. Can you explain what it is? Most of the time, we tend to put all information in IT tools for multiple reasons and benefits: backup storage, history status, generate reports, etc. Visual management gives immediate access to the information, and encourages commitment from team members. I’m not in favor of one or another method, best is to have a good balance between IT tools and visual management. InfoQ: How can agile teams and organizations benefit from using visual management? Can you give an example? Bruno: At first, visual management can look odd, especially when everything today is numeric. I often hear “Hey, I don’t make crafts, I’m done with kindergarten”. But here it is, the challenge of visual management is just... to try it. You can test it on a team or an organization. Ask yourself: What important information would you like to communicate? It can be: the next application release date, the date of arrival of a new employee, a database scheme, or the announcement of a new customer contract. Next, find a visual way to present the information and try it. 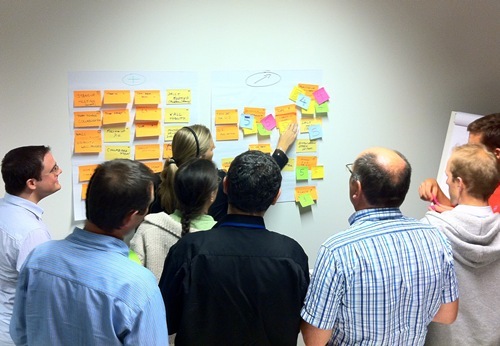 As an example, I have seen that visual management attracts people, even from other teams. Some teams that weren’t necessarily involved in our project, stopped by our wall, and commented, providing interesting feedback. Despite its ‘low-tech’ or ‘basic’ aspect, visual management appears to be an excellent tool of communication and collaboration. It improves team’s ability to take ownership of a task, and it gives immediate view on tasks’ progress. Moreover, it increases communication and sharing of information. An example: Imagine you need to put 20 things in order (for example: projects or requirements to prioritize). A classical way of working would be to set up a meeting with decision-makers. One person would be in charge, and use a laptop and a beamer with an excel sheet. People would then discuss, when the one in charge would take notes on the excel sheet. With visual management, the approach can be to arrange a meeting where you write the 20 things to put in order on post-it notes (one idea per post-it note), Stick them randomly on a wall and ask the group to order them by priority. You will notice team collaboration and a totally different energy in the group (see picture). As far as I know, there is no scientific explanation specifically on visual management benefits. In my opinion, it can be explained with Neuro-linguistic Programming (NLP), a psychological branch. NLP demonstrates there are different ‘learning styles’: visual learners, auditory learners, kinesthetic learners. When a daily meeting takes places next to a wall, where there is visual management, it recalls all “learning styles’, there is an auditive, visual and kinesthetic dimension that would suit all team members. InfoQ: You are referring to NLP, can you elaborate about how you use it? Bruno: NLP (Neuro-linguistic-programming) is a psychology branch that can be used for communication, personal development, and psychotherapy. Whereas other kind of approach would analyse 'where the problem stands'; NLP analyses 'why it works"? It is interesting to see that NLP, such as Scrum stands on empiricism, to observe what is efficient and provides results. As any other psychological or scientific approach, NLP gathers strong believer or non-believer. I'm not a defender or opposed to NLP, I get inspiration of what exists and works, I combine and use it in order to achieve objectives and get benefits. InfoQ: As an agile coach, is there a specific agile practice that you like most? Why? Bruno: As an Agile Coach, I consider that most of my job is to help improving communication and collaboration within a team or an organization. I’m satisfied when I see people feeling confident enough to play their part in a team. Then the magic works and wonderful achievements happen. Two of my favorite tools are Give and Take feedback, and Team-building workshops. They are powerful tools that I regularly use, and I’ve witnessed interesting experience, and concrete improvements within teams. Bruno Sbille is a Trainer (Agile, Soft Skills) and a Coach (Agile, Life Coach). He has been working in IT and Business consultancy since 1999. In addition to his experience as developer and project manager, he had the opportunity to discover a lot of new techniques to add in his "toolbox": Scrum, Agile but also NLP, coaching, people management, creativity techniques, serious games, etc. He is passionate about "making things happen". Bruno regularly blogs in English and French about Scrum, Agile and Management on Scrum and Agile blog. He tweets @BrunoSbille. There are different ways to develop our leadership style; most probably people are facing problems in their personal as well as professional life, due to lack of leadership. Therefore, they used to follow different types of instructions and expert advice to deal with their leadership issues. Here from this article also, we can get some essential tips regarding leadership and while following this interview conversation, we are able to learn something better regarding leadership and visual management.